We also encourage our members to demonstrate their musical talents, both instrumental and vocal, through special music and performances. 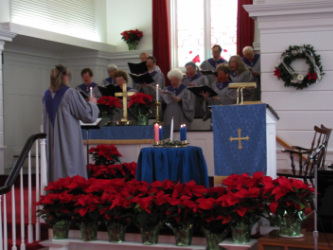 The Chancel Choir rehearses every Tuesdays at 7:15 PM from September to June for rehearsal, and 9:30 AM on Sundays to prepare for service. The choir prepares a wide range of religious music for Introit, Benediction, and Anthem in two & four part harmony. All voices (Soprano, Alto, Tenor and Bass), and musical skill level (even if members can not read music) are encouraged to join. Beginning a bell choir is a goal in the coming year. The church has at least a 5 octave set of White Chapel Hand Bells. Through member interest and commitment we hope to begin the ensemble.